Photo courtesy of Moxy San Diego. Marriott International’s experiential hotel brand, Moxy Hotels, has opened its first location in San Diego. 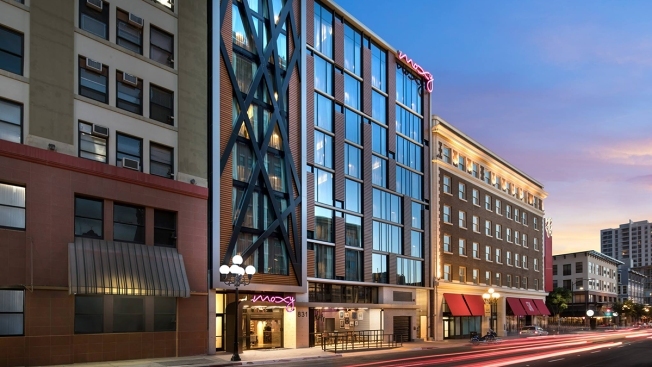 Developed with San Diego-based J Street Hospitality and Azul Hospitality Group, Moxy San Diego is a nine-story, 126-room, millennial-minded boutique hotel in San Diego’s Gaslamp Quarter. Moxy San Diego pays homage to the city’s naval history, featuring a camouflage wall, exposed electrical conduit, steel finishing and wood accents in the lobby. A shipping container lining the CrossFit-style fitness center, dungaree denim headboards in the rooms and porthole mirrors are also featured throughout. Upon entering the hotel, guest will check in at a custom “trike,” where they will receive digital room keys as well as Bar Moxy’s signature “Got Moxy #5” nitro-cocktail served from a tricycle. Additional signature elements include the Moxy Digital Guestbook and streamed videos and images taken within Moxy Hotels and tagged #AtTheMoxy.